It seems to me that everyone in my life is trying to lose a little weight right now. I’m not sure if this is actually a new phenomenon or something I just happen to be noticing. But either way, between many friends turning 30 and feeling old, others getting ready to be married or recovering from having babies, and a weight loss contest at my office, I hear a lot about pounds and calories and steps and blood pressure. I like to consider myself immune from this sort of hysteria – I’m already a pretty healthy weight for my height, and my other numbers are good too. Nonetheless, it certainly makes me extra aware of what I’m putting into my body. I’ve been a little down lately, which makes me more susceptible to the siren song of my favorite junk foods (Hello potato chips and coconut ice cream!). Add to that how hot it’s been, and I not only don’t feel like cooking, I’m more inclined to take the bus to work. So we’ve been eating a lot of take-out and convenience foods. I started my day late, around 10:30am with a big glass of water and a 15 minute yoga routine, then followed it up with a peach and a cup of green tea while I cooked some cereal. It was a cool morning, so I figured I better embrace it and have a hot breakfast! I made a half-cup (dry) of Bob’s Red Mill 7 Grain cereal, intending to share it with my man-friend. He didn’t want any so I just ate it all! I flavored it with shiro miso and wakame, and a couple of halved grape tomatoes. Yes, I know that’s weird. It’s also delicious. I polished it off with a glass of homemade kombucha that I flavored with orange juice and red currants. Refreshing! After puttering around on the internet for a while, I decided to take a walk around the neighborhood. I was cold, and since I have issues with my circulation, a brisk walk really helps. I just made a loop down to Highland Park and back around the block, but according to Google Maps, it was almost two miles! I had another cup of green tea when I came back. 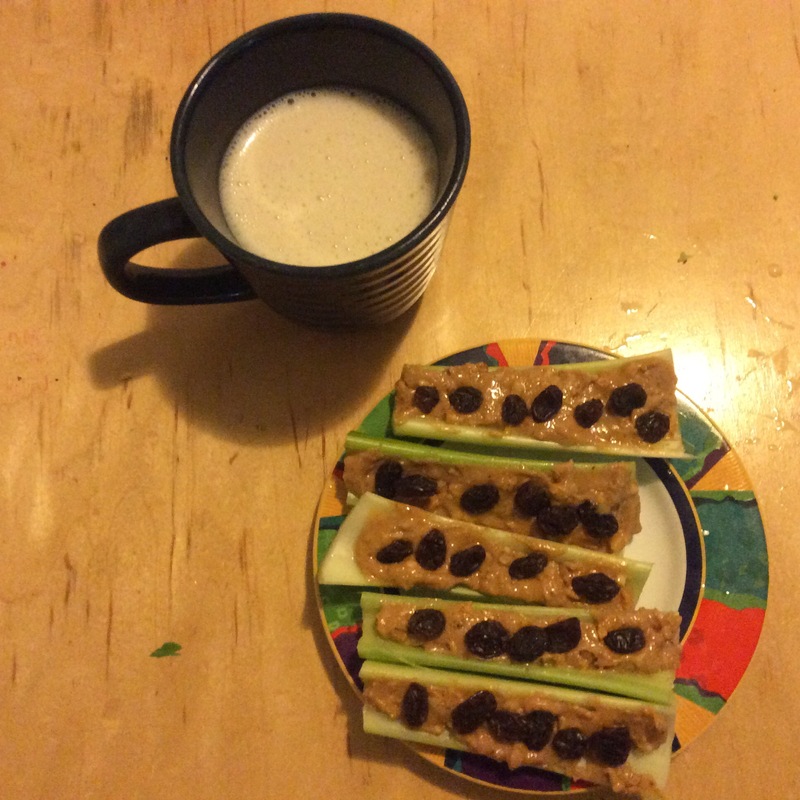 Got a little peckish while doing some computer work, so I made a snack: Ants on a Log! Paired it with a cup of soymilk and got back to work. Dinner had to involve eggplant and bell peppers, since that’s what I had in the fridge! I also had some tempeh, and after perusing How to Cook Everything Vegetarian, I came up with a yummy dish that I paired with brown rice. It was simple enough to make that I’m not going to patronize you with a recipe. 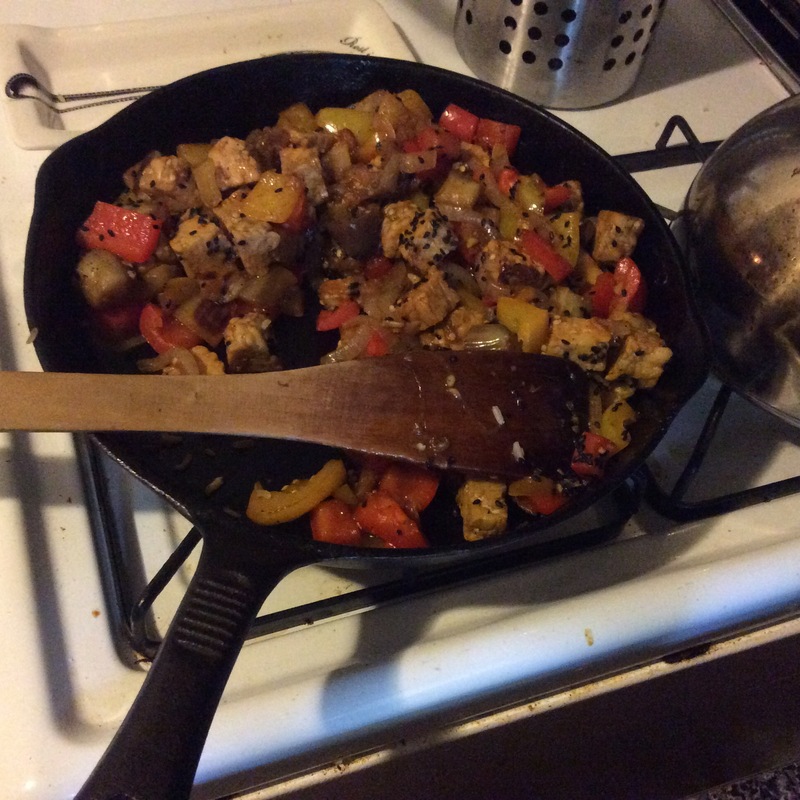 I just sauteed two peppers and an onion, then added cubed tempeh and blackened eggplant. My sauce consisted of 2 tablespoons of tamari and 2 tablespoons of Heinz ketchup, with a tiny bit of sesame oil. The little black flecks are black sesame seeds. 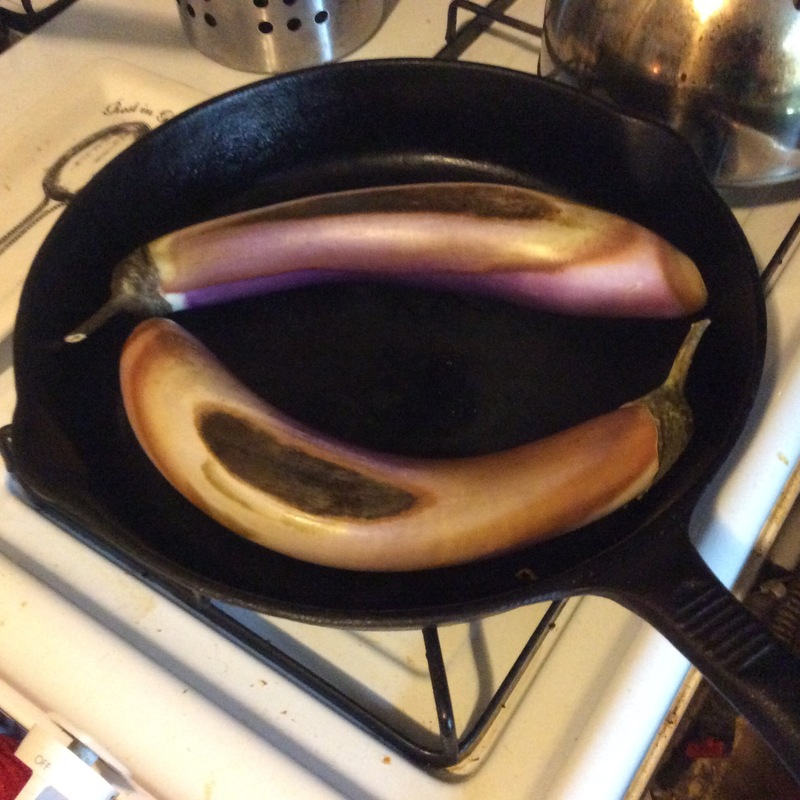 There are two ways to blacken an eggplant, which is the easiest and least fussy way to cook it. 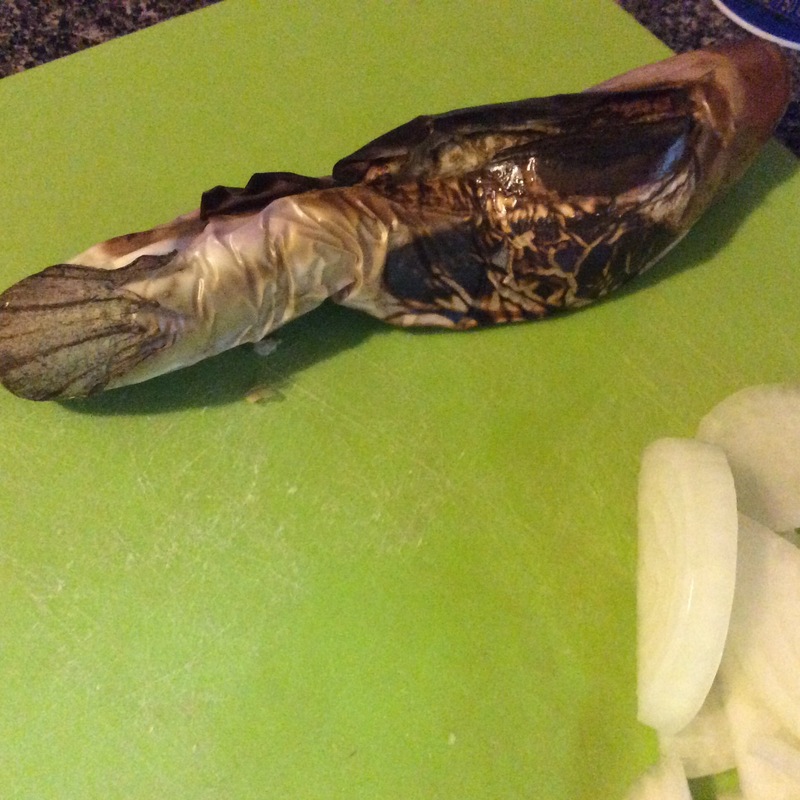 You can do it under the broiler until it collapses, which is great on a cool day or if you have either a big eggplant or a ton of smaller ones. Or, you can do what I did with my two little ones and blacken them in a dry skillet over medium-high flame until they collapse. You have to turn them occasionally, but it’s stupidly easy. That was my day in food! I am not a big believer in counting calories, but I do occasionally log a few days into My Fitness Pal to make sure I’m on the right track. Usually it serves as a big reminder that oil adds A LOT of calories to a meal, so I get back to using less of the stuff. According to the app today, I can still eat another 400 calories. That’s unusual for me, and is probably just because I slept so late that I never really had lunch. It also tells me that I’ve had quite enough sodium, thank you, and could stand to go easier on the cooking oil in my stir-fry. I thought about that when I made it, but I couldn’t talk myself into washing a second pan if I got out the non-stick skillet after blackening the eggplant in cast iron. Anyways, I’m a big believer in food diaries if you want to lose weight. Even without a fancy app, keeping track holds you accountable. Let me know if you thought this was interesting, or I should just stick with recipes. People are always asking me what I eat since I don’t eat animals, so I figured I’d be nice and answer with something other than “Plants.” Not only that, lately I’ve been getting the question, “How do you stay so thin when I see you eating all the time?” Anyway, I could also show a work day of eating later on, if people are interested.